Seldom do I pass on jokes, etc. because that practice becomes something akin to the blob - it grows exponentially as recipients simply must reciprocate and jam email inbox with all manner of garbage. I'm grateful to all my email correspondents for honoring my request to never, ever, under any circumstance, send me jokes, recipes, homilies, chain letters, charitable solicitations, etc. That being said, our friend Terry Crowley over at the Orange Juice! Blog posted a clever piece - a "public service announcement" - that might bring a smile to your face. Here's the LINK. If you're in a part icularly grumpy mood it might help brighten your day. I'm running out of reasons to continue to subscribe to the Los Angeles Times. I like to begin each day by reading many of the offerings on their "Comics And More" page. That is no longer necessary because I've discovered THIS SITE. I fear that the Los Angeles Times may be destined for the fate recently threatened by the Hearst Corporation for it's San Francisco Chronicle - closure. Apparently, the venerable Chronicle is bleeding bucks to the tune of $50 million last year and the flow of outward bound dollars has increased this year. 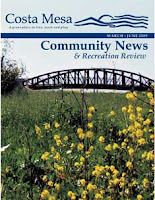 Tonight, at it's first meeting since two new members were appointed by the City Council, the Parks and Recreation Commission will meet at their regularly scheduled time of 6:30 p.m. in the City Council Chambers. You can get a good idea of what this commission is responsible for by visiting THIS SITE. First up will be the election of a new Chairman and Vice Chair. It will be interesting to see what impact the two new guys, Jeff Mathews and Kim Pederson have on the proceedings. 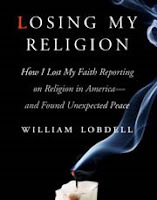 Today was the first day of public sale of former Daily Pilot Editor and Los Angeles Times Religion Reporter Bill Lobdell's new book, "Losing My Religion - How I lost My Faith Reporting on Religion in America... and Found Unexpected Peace". I bought my copy today at Borders on Newport Blvd. and 19th Street. That will be the site of his first book signing event this Saturday, February 28th beginning at 2 p.m. See you there.. 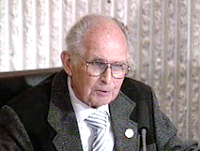 Here's a link to Lobdell's blog which includes a calendar of his events, including an appearance on KOCE Friday, February 27th at 6 p.m.
As mentioned in my last post, long time community activist and elected leader, Donn Hall, is in the hospital. The Daily Pilot has a piece on his illness HERE. We wish him and his family all the best.